What Day Of The Week Was January 4? 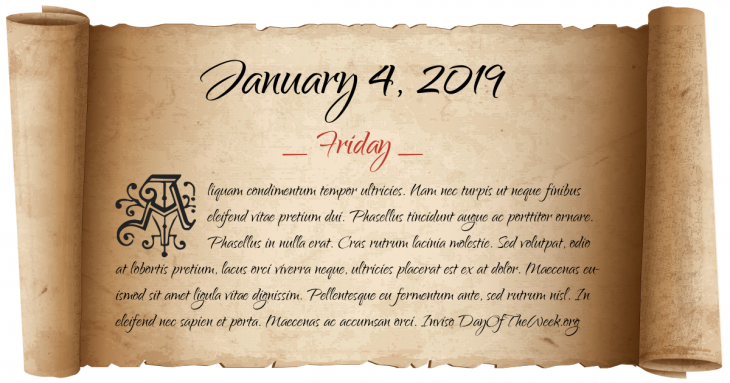 January 4, 2019 was the 4th day of the year 2019 in the Gregorian calendar. There were 361 days remaining until the end of the year. The day of the week was Friday. Anne of Brittany announces that all those who would ally with the king of France will be considered guilty of the crime of Lese-majesty. Great Britain declares war on Spain and Naples. The first successful appendectomy is performed by William W. Grant on Mary Gartside. Rose Heilbron becomes the first female judge to sit at the Old Bailey in London, England, United Kingdom. United States President Richard Nixon refuses to hand over materials subpoenaed by the Senate Watergate Committee. Mikheil Saakashvili is elected President of Georgia following the November 2003 Rose Revolution. Who were born on January 4?